Anne Peitz (Ger)/Fucks (Ger) d. ???? Phoebe Watson (GB)/John Colin Gregory (GB) d ???? The NYT states that Rosie Berthet's mother was born in New York. Note spelling for Charpenel, nee Aimee Cochet. The NYT Times gives their names as Mrs Hackett and Dr Rawlins, both are from California. I have identified Mrs Hackett as being Maude (nee Demarest) Hackett. The official French site lists Magaloff as Nicolas Magaloff, but this could be in error, possibly confusing the Prince with pianist Nicolai Magaloff. The official French site lists E Tapscott as from GB, not SA. Elaine Tapscott is the actual person in question; she is a lesser known sister of the more famous Billie Tapscott. According to the NYT Moriill d Mme Roger Danet (H Danet) in the singles. If Lawn Tennis and Badminton is correct we are missing two scores from the 1R, as it indicates there were 14 byes-not 16. Cross/Wills won a default when one of the French women decided she would rather attend a tea in the countryside than face the famous Helen Wills. There were 17 deuces in the opening game of the Alvarez/Bouman vs Bennett/Watson match. British magazine Lawn Tennis and Badminton as well as American Lawn Tennis. Last edited by Rollo; Feb 27th, 2019 at 11:52 PM. Draws are in exact draw order. Per the New York Times there were 44 women in the singles draw-we only count 43, and all of our main sources reflect this. Bordes=Billout, whose maiden name was Broquedis. Eileen Bennett Whittingstall #3 seed-defaulted in doubles due to illness. Mr P. "Rar" was an alias used by a male player. The Ice queen of tennis gets an early challenge at the French from an unexpected foe, Phyllis Mudford. In the 3rd round Mudford, "who displayed not the slightest trace of stage fright", traded power with the world's #1. Mrs Moody often resorted to soft shots, lobs, and even coming to net to win a 6-2 first set. Mudford stuck to her tactics however, and led 3-2 in the second set. Helen led 5-4, needing 7 deuces to close out the girl some call 'the Sarah Palfrey of England'. An amazing 25 out of 28 games played went to deuce at least once, making this easily the match of the championships on the ladies side. Rain held up play on and off on quaterfinals day. Wills didn't even take off her red cardigan sweater in besting Irmgard Rost. Helen "just pouneded the ball back and forth and waited for the German girl's errors." (NYT) Meanwhile Helen Jacobs upset #2 seed Phoebe Watson. Watson won the first set 7-5 when rain interrupted. On returning Jacobs swept to victory, espcecially sweet given Watson had beaten her twice before in 1929 at the Wightman Cup and the US semfinals. In the semis Jacobs dazzled the crowd with her foot speed, pace of shots, and several winners on overheads. Her emphatic victory over Lili de Alvarez must have given her some hope vs Wills in the final. Most had expected Alvarez to reach the final, but from the start of the tournament the spaniard lacked her usual dash and zest. The other semifinal was a predictable cakewalk for Wills-Moody, who ignored the drizzle that turned into a downpour in beating Cilly Aussem 6-2 6-1. From 2 all in the opening set it turned into a rout. As is the custom at the French the doubles events were concluded first, the doubles final on the 24th and the mixed final on the 28th of May. Ryan and Wills-Moody took home the doubles in a straight set final. Towards the end Helen amazes the crowd with a series of impossible gets and winners. The event drew 94,500 spectators in all. Last edited by Rollo; Nov 2nd, 2018 at 09:10 AM. The doubles and mixed doubles seeds are inferred by their placement in the draw. Most top seeds at the French are at the extreme bottom of the draw, with #2 seeds at the top. Eileen Bennett and Henri Cochet were #1 seeds as the defending champions. They defaulted due to Cochet's illness. In mixed Macready/Grandguillot had a match point vs Aussem/Boussus. Mrs Macready double faulted. Grandguillot, Pierre-Antoine. The NYT gives Grandguillot's name as Pierre (Pierre-Antoine at RG site), not Jacques. Were there two male Grandguillots? Zander, Martin. Listed as R. Zander by the RG site. No one. The draw is totally complete. Cily Aussem becomes the first German female to win a Grand Slam title. She soon follows this up by winning Wimbledon just a few weeks later. Defending champion Helen-Wills Moody opted out of playing in Europe this year. On a sidenote Maud Barger-Wallach is competing here at the age of 60. she turns 61 on June 15th. This surrely makes her one of the oldest, if not the oldest, female to compete in singles at a Grand slam event. Maud, the 1908 US champion, manages 5 games against Mme Le Besnerais in losing in round 1. Mixed Doubles winners Betty Nuthall and Patrick Spencer made a romantic pair, having announced their engagement some weeks before the French. It didn't last, and they did not wed.
Last edited by Rollo; Jan 27th, 2019 at 02:29 AM. Francoise Holzschuch listed as Mme Holzschuch in Le Figaro. Marja Rudowska of Poland is listed as Mlle Rubowska. The NYT calls her Hedwiga Rudowska and her partner as Jean. Daisy Speranza listed as Mme and Mlle Speranza by Le Figaro! Marselek, Ferenc. Listed as B. Marselek. Thanks to Andrew Tas for filling in missing results, including entire 1st round of the doubles. Helen Wills Moody wins her 4th French title. It's her 5th major win in Paris (she also won the '24 Olympics here), but she was never challenged until this year. The invincible Helen hasn't lost a set since 1927, twice this year she came within a point of dropping one. Many hoped for a clash between Wills-Moody and Cilly Aussem of Germany. Mrs Moody skipped the Frencg and Wimbledon in 1931-with Aussem taking both titles. Cilly has been ill all spring however, and retires in the quarterfinals vs Betty Nuthall after splitting sets. Helen doesn't have it all her way though. Swiss star Lolette Payot had 2 set points in set 2 of their quarterfinal. 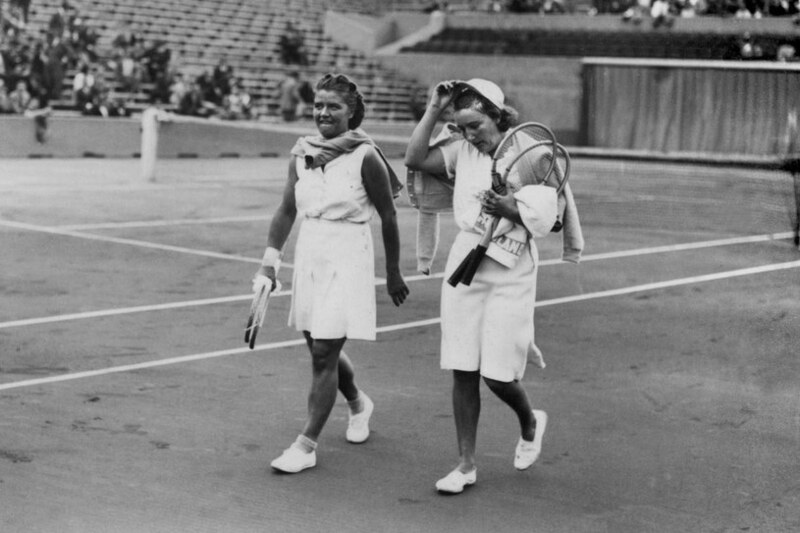 Lolette had the misfortune of twisting her ankle at the start of the match due to the court being over-sprinkled with water. Wills was up 4-0 before Payot even got a game. Perhaps more confident in her ankle, the Swiss Miss got tougher in the 2nd. Only in the last couple of games did Wills-Moody show the power she is famous for. Payot was somewhat lucky to get to the quarters. In the round of 16 her opponent, #8 seed Lili de Alvarez, requested a delay in play. When French officials refused to grant the request Alvarez defaulted. In the semis, Mrs. Moody was severely pushed when the Krahwinkel had a set point and a sitter volley. Hilde lost the first set 6-3 by trying to hit as hard as Helen. Even here she fought hard though, only going down on the 6th set point. Down 0-3 in the 2nd, the German changed tactics. She is also a cross country skier and can retrieve all day. Change of pace worked. Wills-Moody failed to close the match out at 5-3. She failed again ahead 6-5-when Hilde saved 3 match points. The German had her chance at 7-6 and 40-30. Set point. She had a sitter volley and missed the easy shot long. The New York Times wrote of the final that, "Mrs Moody won today without exhibiting her customary exceptional qualities. She passed the last two days in bed because of blisters on her feet and was not in the best form...." Mathieu led 4-1 before Wills marched back to take the first set. Helen wore the Frenchwoman down with defensive play, a very uncharacteristic tactic from the usually hard hitting American. By 4 all Mme Mathieu was visibly out of breath. 5-4 for Mrs Moody. The next game was the best of the match. Deuces and ads went back and forth. When Mathieu won it with a crosscourt passing shot she got a standing ovation. This was her last stand however, as Wills-Moody took the next 3 games and the set. After the first set the inevitable result quickly came. Thus after 3 tests Helen's streak of match wins and sets continues, but Paris held out hope for those who wish to find a rival for the world conquering Wills-Moody. Last edited by Rollo; Jan 27th, 2019 at 04:20 AM. Madzy Rollin-Couquerque listed as Mlle Couquerque by Le Figaro. Elizabeth Ryan opted not to play singles. J. Gautier. Could this be Didy Gaultier, who we know was active in the 1930s? Thanks to AndrewTas for many missing results. Helen Jacobs in still in search of a major outside of the US Championships. It won't happen at Roland Garros this year. She presses Simone Mathieu in a close semi, having two set points in the opening set. Mathieu survives the test however, and goes to win 8-6 6-3. In the final Mathieu "battered Miss Scriven's weak backhand all day" but the speed of the Englishwoman compensated for it. 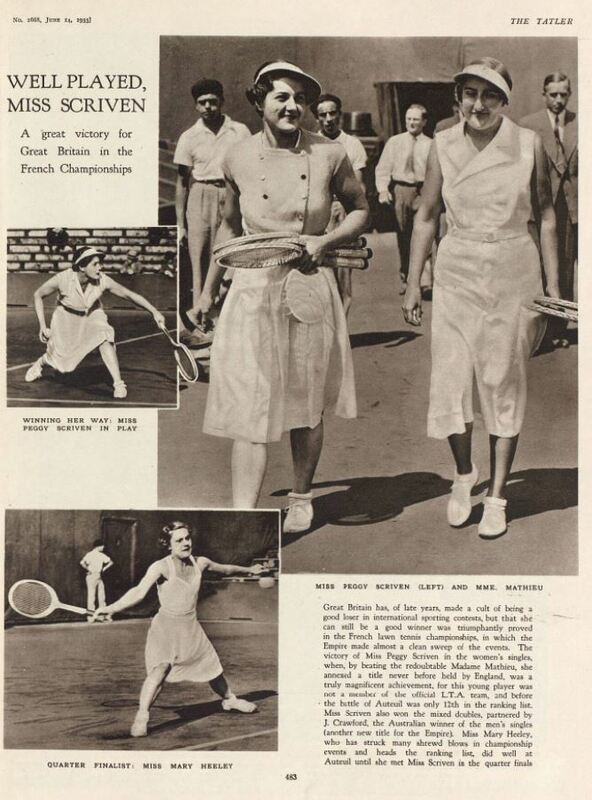 Scriven was only ranked #12 in all of Britain for 1932. In fact she was so overlooked the British left her off the official tea at Roland Garros! She is the first British French Open champ. Scriven also becomes the first unseeded female to win a slam. The third break with precedent is in being the first lefthanded female to win a singles slam. As usual in the French, the first week is given over entirely to doubles competition. Last edited by Rollo; Sep 29th, 2017 at 01:49 PM. All draws are complete and in draw order. Heat was the norm, with not a drop of rain from start to finish. Shorts make their first appearance in France. 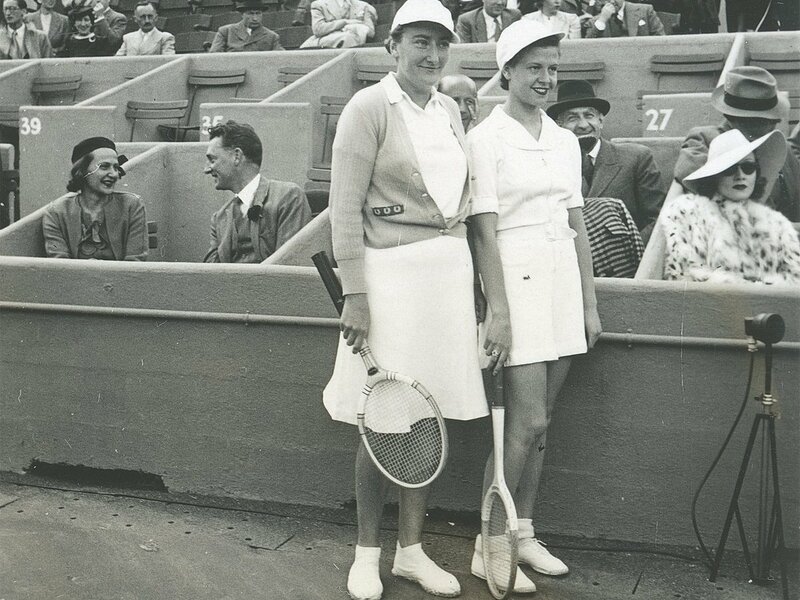 American Lawn Tennis notes that, "Carolin Babcock looks like a boy and Helen Jacobs is most becoming" in them. Most spectators are dressed up (hats for men and dresses for women) but one daring woman wore shorts for the finals. An American-French women's event was held during the event and helped add several US women to the draw. American hopeful Alice Marble is seeded #3 in the women's event. She wins her 1st round match easily. The next day during the US s France competition she collapses during her match on a hot day and is taken to the hospital. She defaults from the tournament, and it is feared her career is at an end. Only after two years of struggle does she return to the courts in 1936. Marble never did play in the French again and only competed in one other clay court event her entire career. Another casualty of the Anglo-French event was Sylvia Henrotin. The #7 seed twists her ankle on the court and is is forced to default in all events. Betty Nuthall continued her poor form this year, double faulting in droves and hitting hard balls that are falling out. Clay doesn't suit the aggressiveness Helen Jacobs likes. In the quarters the surface and the pugnacious Swiss Miss Lolette Payot test her to the edge of the cliff. After splitting sets Payot led 5-3. Jacobs hung on as is her wont. Somehow she broke back to even matters. Loud cheers went up for Jacobs as she took the match 6-3 1-6 8-6 on an overhead smash. Both semis were straight sets affairs. Jacobs easily beat Mathieu and Scriven too a tougher 7-5 6-3 encounter vs Cilly Aussem. Both Mathieu and Aussem were returning from ill health, and neither had the stamina needed. The women's final was a disgrace due to poor planning. The men's final was started late in the afternoon and didn't finish until 6:30. The women were put on court with clouds dimming what light remained. Helen jumped out to an early 4-2 lead by coming to net, but as the match wore on this tactic proved fruitless as it got darker. Endless rallies went back and forth, Miss Jacobs being unable to rush the net as usual because she couldn't see. At 7:50 the sets were split. Most of the crowd had left because they couldn't see from the stands, and Helen requested have the final set postponed til the next day. A British official urged Peggy to disagree, which she did. The umpire told them to play on. At 3-1 (a reporter counted 406 shots in those 4 games) to Scriven, Helen again requested a delay. A ten minute "conference" (in fact an argument) at the chair saw the tournament referee come out. He ordered them to play on. Deflated, Jacobs got only 2 points in the last 3 games. "Before a handful of fans who had stayed to the bitter end, Peggy Scriven had retained her championship. The clock showed 8:27". The French are heavily criticized for attempting a Wimbledon-like schedule without the organization (matches often start late because officials aren't punctual) or facilities (they only have 7 courts to Wimbledon's 20). 7,000 attend on the last day as Mathieu and Ryan beat Jacobs and Palfrey. Palfrey plays well in an attempt to prop up her team. Jacobs plays poorly, still upset over the singles final the night before. The Americans won the opener 6-3 by directing all their attack at Simone Mathieu. From 4 all in the second set Mathieu and Ryan edged ahead to win 6-4. In the last set Sarah made brilliant gets at the net, but not enough to overcome Helen's errors. Last edited by Rollo; Apr 30th, 2018 at 09:00 PM. Charpenel was the sister of famous French star Cochet. Top seeds for the mixed doubles are inferred. The French regularly placed the top seed at the bottom of the draw. Thanks to Andrew Tas for filling in missing results, including almost all of the 1st round. British Lawn Tennis and Badminton. For the first time since anyone can remember "Bunny" Ryan is not competing in Paris. A fixture on the European tennis circuit since 1912, she announced her retirement in Rome. 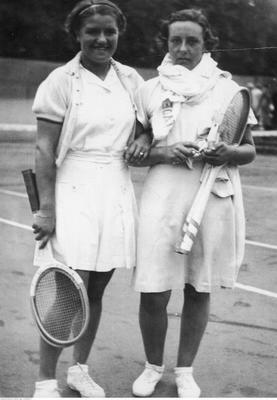 She was still good enough in her 40s to win the French doubles in 1934. Children's day first started this year. 3000 tickets were given free to "young scholars", who made quite a racket on the first Thursday of play. A rash of upsets marks the doubles. The champs breeze home in 30 minutes using the "Australian" formation against a team where neither lady is strong at net. Simone Mathieu ran defending champ Scriven in the semis. The young mother kept looking towards her husband in the stands (only 50 people were watching) in the tense first set, but after winning it at 8-6 she breezed home as Peggy had nothing left. Jacobs was frustrated again in her bid for a French. When her volleys found the net too often she resorted to drop shots, for no one can beat Hilde straight up from the baseline. The stork-like Sperling is " a wizard at at getting up quickly, either to put away the dinky teasers, or to retreat again safely to the baseline". Helen saved 6 match points before bowing out. The final was "utterly devoid of interest". Hilde did everything Mathieu could, but better. 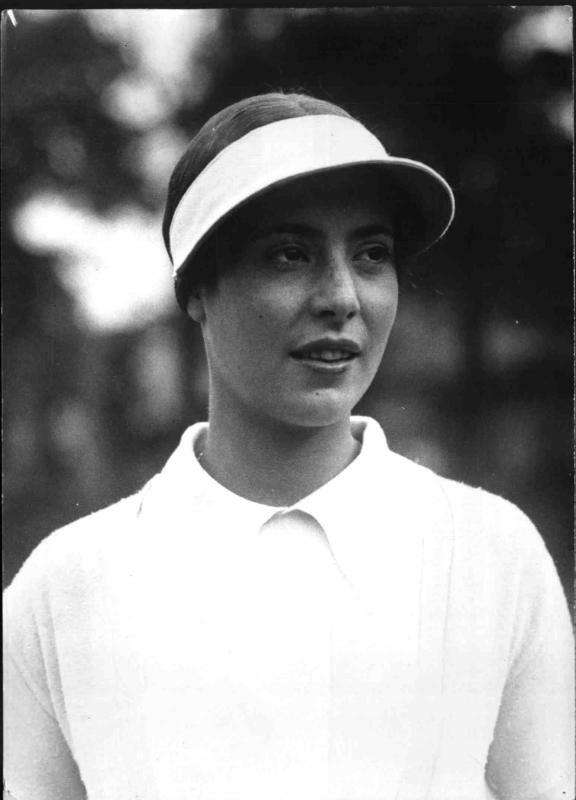 Early figures of interest include the Czech beauty Cepkova, nicknamed "the Greta Garbo of tennis", and tiny Chilean Anita Lizana. Lizana is on her first world tour and quickly improving. Her different look ("like an Inca princess" according to one writer) and style (she rockets back balls on the rise like a half-volley from the baseline) attract attention. Last edited by Rollo; May 6th, 2018 at 12:51 AM. Mathieu gulping water in the final. Helen Jacobs was originally entered but was ill from earlier in the month during a trip to Vienna and did not compete. Dorothy Andrus of the US planned to play but broke a bone in her right arm. The British LTM and RG site agree on Daisy Speranza-Wyns rather than Enya Speranza-Wyns. Le Matin refers to her as Mme Speranza. The NYT has "Miss Jeanne Varin" rather than Mme Andree Varin. We know she was married. The LTM has Miss AC Weaver. Another (????) has Elisabeth Weaver as Austrian, but I see no person in the Austrian top ten. The NYT, on the other hand, calls her Mrs J.D. Weaver of England. C. P. Brutton. Called Mlle Brutton by a French paper. An early round shock is the defeat of the 1933 and 1934 champ Peggy Scriven. Simone Gorodnitchenko, unheralded and French, took out the 2 time champion 0-6 6-4 8-6. #2 seed Simone Mathieu destroyed Belgian Nelly Adamson in the quarters. The 6-0 6-2 slaughter was never in doubt, Adamson's net seeking tactics played into Simone's hands, and she was nervous on top on that. Hopes for a comeback by the sparkling Spanaird Lili de Alverez, now Countess Valdene, are spoiled in the semis by the steady Hilde Sperling. The tall runner simply puts the ball to Lili's backhand and waits for errors. When the Countess did pull off a spectacular shot the long reach of Sperling usually got it back to return to a neutral postion. The other semi saw Mathieu struggle to put away Horn. Simone led 4-1 in the first-the German then puled up to 4 all before dropping two games for the set. "Frl Horn was tenacious" from 2-5 in the second, saving 10 match points in the last game before Mathieu won it on match point #11. Sperling won a dour match as it her wont. Mathieu came up from 0-3 in the second by some clever volleying to get to 3-4. At 5-3 Hilde had a match point, losing it by netting a ball on the 39th shot. She closed it out at 5-4, making this event a triumph for Germans, as Gottfried von Cramm had won the men's singles. 8,000 are present for the final. Last edited by Rollo; May 3rd, 2018 at 08:56 PM. Dates: May 18 to 30. Dorothy Andrus defaulted in singles and the mixed to save energy for the doubles. The strategy arguably paid off, as she reached the doubles final. Both the NYT and the French site concur in using the name Daisy Speranza-Wyns. (Mrs Speranza Wyns per the NYT). The Countess Valdene is much better known under her maiden name of Lili de Alvarez. Karin Forssell of Sweden listed as M. Forsell by French site and Miss M Forsell by Le Figaro. Elizabeth Weaver listed as Miss A.C. Weaver by French site. The New York Times calls her Mrs J. D. Weaver. Le Figaro Mrs A. C. Weaver! Earlier in the event Helen Jacobs tries and fails for the 7th time to annex the only big title to elude her. Hard hitting Pole Jedrzejowska takes her out. To many onlookers it appeared that Jacobs was hampered by a hurt shoulder. "Jed's" fast driving almost propels her to the final, but Mathieu proves too steady. Mathieu loses her 6th French final in front of a half-filled stadium. Sperling was stingy with games, dropping only 19 in total over 10 sets and 5 matches. Needless to say she did not drop a set. The doubles final also lacked entertainment. After winning the opening set Dorothy Andrus and Sylvia Henrotin fell apart with numerous errors as Simone Mathieu and Billie Yorke defended their doubles crown. Last edited by Rollo; Nov 5th, 2017 at 06:26 PM. Mathieu on the left and Nelly Landry (later Adamson) on the right. Famous actress Marlene Dietrich is watching in a hat, sunglasses and fur coat off to the far right. This is not conclusive however, as the New York Times labeled early round upset victims Andrus and Henrotin "favorites in win the doubles crown." Aussie sources have Donald Butler (GB) rather than Benny Berthet as the partner of Jean Saunders in the mixed. Ida Bourdet, nee Adamoff plays her last French championships. Le Figaro lists her as Mme Bourdet-Adamoff. Edith Curdel-Belliard=nee Edith Belliard. We use the styling adopted by Le Figaro. Karin Forsell listed as M Forsell by the French site. I am using Karin Forsell as she was ranked #10 in Sweden in 1938. Alice Weiwers listed as "Weiwers" and "Weivers" by Le Figaro. None. All names are complete. A later than usual start date pushes the event to early June-a full two weeks later than in 1937. This spells trouble for the quality of the event, as the top Brits and Americans are in Britain for the Wimbledon tuneups and Wightman Cup, held June 10-11. 3 time defending champion Hilde Sperling does not appear. Even Jadwiga Jedrzejowska, another top tenner and regular at Roland Garros, is also in England playing grass warmups. Andrus is the lone US female entry, while fellow Yank Donald Budge is here chasing The Grand Slam of tennis after his win in Australia. This makes Simone Mathieu the prohibitive favorite as the only real top ten player in the draw. The question marks are the Australian contingent of Thelma Coyne, Nell Hopman, Dot Stevenson, and especially Nancye Wynne. They have flown to Paris (the first plane trip ever for most of them) in hopes of capturing glory on European red clay. Unfortunately they flew straight from English low and fast bouncing grass to high bouncing clay with no practice on it at all. The Aussie girls predictably crashed out early. Coyne had influenza. Wynne was seeded #2, but was easily beaten by Jacqueline Goldschmidt, 8th ranked French player, in the round of 16. Nancye, who said after the match that she couldn't get used to the light balls, send shot after shot into the net or wide when going down the line. After a 6-0 blowout she made a fight of it to get to 3 all in the 2nd set, losing 6-0 6-3. Wynne's habit of "bouncing her racquet on the ground and catching it like a yo-yo" is a novelty in this staid era. The last Aussie standing was Dot Stevenson. In the quarters she gave Simone Mathieu her sternest test of the tournament. Dot dropped serve to start the match, but held from there out. Stevenson used a nice backhand crosscourt and several drop shots to score points. Mathieu held on to win a 6-4 set by 30 points to 27. From that point the floor fell out from under Stevenson. Her backhand went off, and Mathieu, not normally a volleyer, even came in to net to make several winners. The second set flew by at 6-0 and 31 points to 19. The semifinals were played on the #2 court, resulting in easy wins for Mathieu and Landry. Simone Mathieu sweeps aside all opposition easily and finally wins her nation's title in an anticlimax. Surprise finalist Nelly Landry has upset 3 players to reach the final, where she was outclassed 6-0 6-3. Anticlimatic or not, this win was a joyous validation of her iron will that bore fruit at last. Mme Mathieu never lost more then 4 games in a match. The #1 French female for over a decade had lost 6 previous singles finals at Roland Garros. Only 3,000 saw Simone win the final. To make matters worse, many of those present showed their impatience at long rallies with whistles and other signs that the ladies were a warmup for the men's final, which was a likwise a blowout. On the last day Mathieu captured the triple crown here-taking the doubles with Brit Billie Yorke for the 3rd year running and the mixed with Yugoslav Dragutin Mitic. The doubles was easy, while the mixed final went to 3 sets. Aussie Nancye Wynne smashed multiple overhead winners to win the first set with French male #1 Christian Boussus. After dropping the 2nd set Wynne and Boussus led 4-2 when Nancye held serve after 2 deuces. Boussus dropped his serve though, and with a series of drop shots, lobs, high bounding topspin and hard passing shots Simone nudged her pair to victory with four consecutive games. In contrast to the singles final Simone was given appreciation by a large and warm crowd of 12,000 entertained to the fullest. Mathieu is the first known mother to win the French. An amusing report from the Townsville Daily Bulletin reports "Mme Mathieu's three children sat alone on the top of a tier at the Stade Roland Garros and cheered shrilly" as their mom won a close mixed semi match and the women's final. Last edited by Rollo; May 3rd, 2018 at 08:44 PM. Mme JP Claude=Leila Claude-Anet according to The Grand Slam record book, but this was her maiden name and her married name was Mme de Verrerier. This is probably explained by her taking her father's initials. Frank Wilde is listed as HD (Henry David) Wilde. Only 6 known seeds in the singles. There may be other missing 1R mixed results, especially considering the size of the draws. A mixed draw of 28 to 32 is more likely. Mlle Kerckhoff is from the Netherlands. There was an A. Kerckhoff and a Z. Kerckhoff. Which one was here? No German entries at all, as tension and rumours of war in Europe run high. Running so close to Wimbledon also discourages many entries. The event used to be held in May. Gracyn Wheeler, traveling independently of the USTA, has a set point taken from her by a bad line call in a late afternoon match vs Mary Hardwick. The winner went right into the corner and was called out at 6-5. She ended up losing the set 10-8 and the steam went out of her gradually, having played a match earlier in the morning. The #4 seed finally won as the sun sank. Most of the seeds held until the quarterfinals, only #5 Dutch player Rollin Conquerque falling. Then the major surprises came. A seriously off form Jadwiga Jedrzejowska barely survives a tight third set vs Halff in the quarters. Her famous forehand was flying everywhere and too often wildly missing. Pannetier lulled Hardwick into playing from the baseline, winning despite her underhanded serve. Mary had a 3-1 lead in set one and played with caution, playing right into Suzanne's steady hands. Hardwick looked like coming to life when she tied at 4-4 in the second with splendid volleys, but then dropped the next 8 points for the match. "Miss Fabyan was another grass court player to be caught in the toils of this slow rubble", getting only 2 games from Mme Lebailly. The lefty used the dropper repeatedly as Sarah dug her won grave in the dirt with numerous backhand and volley errors. The semis ended the run of the unseeded semifinalists. Lebailly fought well and extended the Pole to 3 sets ,"but for all her nice control on the backhand, this was largely because Mlle Jedrzejowska's flaming forehand was so loose. Then Mlle S Pannetier had nothing like the necessary strokes to take on so shrewd an opponent like Mme Mathieu...even though she be the French #2." Could the popular Pole finally win a major in her third final? It was not to be. Jaja pulled up from a set and 3-5 down to tie at 5 all, but consistency won over brilliance as it usually does on hard courts. As the Times noted, "against a shrewd adversary like Mme Mathieu, hitting one winner to two losers was of little use.Then Mlle Jedrzejowska made some telling moves with the drop shot, yet Mme Mathieu got to most of them and was prepared to volley the return; one has rarely seen her covering a court so quickly." Last edited by Rollo; May 3rd, 2018 at 08:46 PM. In May of 1940 Germany invades and occupies France. There is no French Open for 1940. Events were held between 1941 and 1945, though these are counted as full championships. Not until 1946 did the international tennis community return to France in full force. The event was called the "Tournoi de France"-a closed event only for French, yet Payot (a Swiss national) was the 1945 winner. It's useful to remember that at least one British woman also reached the women's closed final in the early 1900's. Last edited by Rollo; Mar 10th, 2017 at 03:03 AM. Cosette Saint-Omer-Roy/Alice Weiwers (Lux) d. ???? Aimée Charpenel/Jacqueline Vives d. Henriette Morel-Deville/Andrée Varin ???? Suzanne Pannetier/Roger Dessair d. ???? Mlle Morane --could beJacqueline or Marie-Simone Morane. After a one year hiatus due to the German ivasion of 1940 the French resumes under the title the "Tornoi de France." The German occupation precluded any real international involvement. Even Weiwers, from Luxembourg, was sometimes listed as French. Last edited by Rollo; Oct 16th, 2017 at 02:11 AM. Where no results known in opening rounds I have inferred byes. Simone Laffargue=Mme Laffargue. The French sources are clearly Laffargue (double f) and not Lafargue. Mme Monique Laisne was born Monique Hamelin. We will use Payot-Dodille in the English style, not Dodille-Payot, though this is the format used at times in French. Thanks to Jimbo and Newmark for dates and scores. Played under German occupation. Entries may have been limited to French Nationals only. Payot was of Swiss birth but wed to a Frenchman, and Alice Weiwers, often listed as from Luxembourg, was also often listed as French. Last edited by Rollo; Mar 10th, 2017 at 03:37 AM. Simone Lafargue d. Andree Varin ???? Leila Claude d. Simone Kleinadel ???? Cosette St Omer Roy/Alice Weiwers d. ???? Simone Kleinadel/Anne-Marie Seghers d. ???? Cosette St Omer Roy/Alice Weiwers d. Genevieve Grobois/Claude Manescau 3-6 9-7 7-5. Ce Soir mentions rankings in covering the event. Mottez: mixed partner of Maud Galtier, nee Mottez. Thus he may be her brother. For certain he is a male relative. In a final of high quality Alice Weivers falls to the drop shots of Mme Lafargue. Weivers hits her way to a 3-0 lead in the second set and stretches it to 5-2, but cannot get another game. Mme Lafargue (Or Laffargue, French papers are inconsistent) had won the Championships of the Southern Zone earlier in the year. This title confirms her supremacy in occupied France. The semis were held in brutal heat, the temperature when Lafargue and Claude went on court was 48 degrees centigrade (118 Fahrenheit). Mme Claude could not cope with the extreme heat or the game of #1 Simone Lafargue in the semis. Inevitably long rallies were ended with a deadly drop shot by Mme Lafargue despite the steady tactics Mme Claude employed. Suzanne Pannetier could not drop her way to victory in a similar manner over Alice Weivers, who hit with too much authority and had a useful volley. In the doubles final St Omer Roy and Weivers won a squeaker despite Cosette making a load of errors. When she left the court after the second set it was to a cascade of boos. Weivers kept her team from crumbling, saving a match point at 4-5 in the last chapter. Last edited by Rollo; Oct 16th, 2017 at 02:07 AM.